Schooling your horse consistently can be frustrating. While yesterday’s ride may have been full of flawless lead changes, today your horse may give you sloppy transitions and temper tantrums. It’s easy to forget some of the basic rules of horsemanship when the going gets tough. With these tips from two experienced trainers, you’ll be back on track in no time. If your horse doesn’t respect you on the ground, your time in the saddle could be a bit of a struggle. For example, Bobbie Skelton, western riding instructor and faculty member at Colorado State University, says not to let your horse get in front of you when you’re leading him. No matter how fresh your horse is, it’s important to keep him from walking all over you when grooming and tacking up. 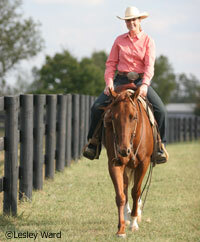 If you always take your horse on the same trail or ride him through the same patterns, he can get bored. Giving your horse a job to do can improve the quality of your riding sessions. Skelton suggests setting up small obstacles, such as cones, and riding around them as you would in a horsemanship pattern. One or two obstacles won’t be as intense as a full pattern, but they will still help you direct your horse and think about transitions. Obstacles will also help you work toward a goal in each session. According to Quest, horsemanship is all about communication. “If you don’t speak a horse’s language, don’t get mad at him. Slow down,” he says. 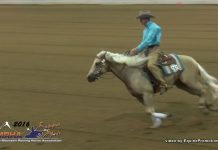 For instance, if your horse has trouble bending in the first half of a large reining circle, it’s possible that your cue wasn’t obvious to him. It’s important to ride from your leg and to only use your hands as a guide. 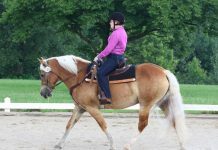 If you want your horse to circle, sit to the outside of the saddle first so he knows you’re going to ask him to turn; add a rein cue as necessary. 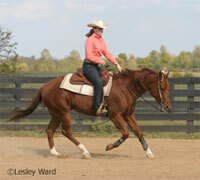 Your horse’s rhythm dictates when he can make transitions. He can’t stop if all four feet are off the ground, so it’s important to be aware of where your horse’s feet are when you cue him. One of the best ways to feel the rhythm of a horse is to relax and focus on his footsteps. “Riders are sometimes so focused on certain things that they forget to relax, and that goes through to the horse,” says Skelton. Make sure you remember to breathe when you ride. If you’re tense, try singing along with music. This forces you to breathe, which will help you find your horse’s rhythm. 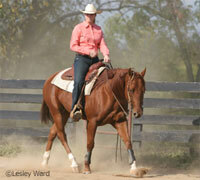 Your body position in the saddle has a significant impact on your horse’s ability to move underneath you. It’s easy to direct all of your attention to your horse and forget about your own position. Looking at the ground and riding with slumped shoulders and tension in your hips are bad habits that can be hard to break. It can be difficult to ride every day, so make every ride as productive as possible. While warming up your horse, work on your strength. Stand up in the stirrups for several minutes at the walk and trot. “Standing in the stirrups is a good exercise for balance and for getting your heels below your toes. Stretch down into your heels, and make sure they stay underneath your hips,” Skelton says. Quest also recommends riding without stirrups because it forces a rider to sit independently in the saddle and to not rely on the stirrups and reins for balance. A good rule of thumb is to align your head, shoulders, hips and heels. It may take some practice, but keeping your body in line will help you control your balance. Never underestimate the benefits of a knowledgeable horse person or trainer. Sometimes it’s hard to see what’s really going on between you and your horse. Skelton recommends having a trainer or friend longe your horse while you ride. Having someone else take control of your horse allows you to focus on your position. It’s important for you to be balanced and in rhythm during your rides, but don’t forget about your horse’s balance. In order for you and your horse to work effectively together, you need to understand how the horse moves, and that’s difficult to see from the saddle. “Put your horse on the longeline and see how he naturally goes,” explains Quest. If your horse’s balance is where you want it, just stay out of his way when you ride. If he is too heavy on the forehand, he will need to be taught to drive from behind and elevate in the front. This takes some skill to teach. If it is beyond your expertise, Quest advises seeking professional help. Schooling can be a challenging but rewarding process. Keep these tips in mind to get the most from your rides.